Mohamed is a qualified Special Educator with over eight years’ experience after graduating from the Higher Institute of Special Education of Tunisia in 2010. His passion for supporting children lead Mohamed to work for voluntary world organizations such as Red Cross, Dutch Association (Les Oiseaux Bleu) and Athers Association. 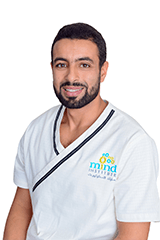 Mohamed has worked across a variety of settings that support children with intellectual and learning disabilities. He considers himself to be a dedicated teacher who motivates each child to reach their full potential.